Members of Yanawana’s Post Disaster Response Team are trained and prepared to offer integrative botanical first aid/triage care in post disaster situations locally and statewide, and runs as a sustainable off-grid unit. The Response Team served the Texas Gulf Coast after Hurricane Harvey in 2017 offering assistance, supplies, and free botanical healthcare clinics. 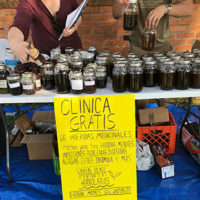 Members of this all-volunteer team include former military medics, clinical herbalists, PA’s, WFR’s, apothecarists, and members of the build team. All volunteers who participate on this team will be instructed in first aid, survival, and cultural awareness. Yanawana Herbolarios is proud to serve on the planning committee for the 2019 Warrior Roots Direct Action Training Camp. This is our 2nd year on the council and our 3rd year participating. This annual direct action training camp is meant to develop leadership and activism skills and raise the consciousness of The People’s Movement in south Texas. Other objectives include cultivating a praxis of decolonization and accountability to the community and Mother Earth. This year’s event will be taking place the weekend of October 11th – 13th at Por Vida Academy Charter High School. Themes for this year’s event will include the history and politics behind activism; intersectionality in activism; and wellness for the warrior. 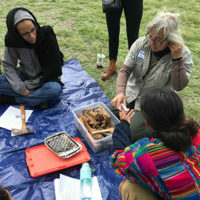 A free family friendly community educational event designed to introduce the community to lost ancestral skills and the concept of self-sustainability. 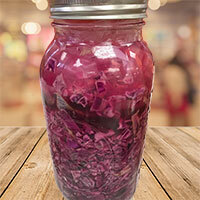 There will be a wide array of interactive workshops available for attendees to participate in, with topics including food preservation, first aid, survival, and botanical medicine making. We will also have apothecary products available for purchase and will be holding a free integrative botanical healthcare clinic during the event. This event will be hosted by Najim YMCA located on San Antonio’s Southside and is slated for May 18th (TBC). Sponsor an intern with your monthly donation and know that you impacted not one life, but an entire community!